Epson, producer of printer, scanner and projectors is well known in the imaging industry. But did you know about Epson's Discproducer line? This is your pathway way for using Epson print technology to produce your Discs. Martin Turner from the UK had the chance to get his hands on the PP-100, and you can read about his experience in this review. Next week Darrell talks about his book Mastering the Nikon D300/D300s and his current project Mastering the D7000. We also discuss Nikkor lenses vs less costly third party lenses and what makes one Nikkor better than another. Prime lenses vs zooms is also discussed. News and announcements: Nikon Coolpix P7000 firmware update. Photo Prescription: View your HDR at 100% before you save it! 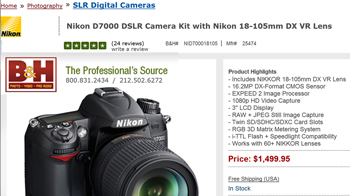 The long wait for "in stock" status on Nikon D7000 cameras seems to be easing up just in time for the Holidays. You can now add New York based B & H Foto & Electronics Corp. to the list of vendors offering the Nikon D7000 with AF-S DX NIKKOR 18-105mm f/3.5-5.6G ED VR kit lens with supplies on hand. Continental USA customers will appreciate the free shipping bonus. His first impressions review on the camera, making comparisons to the Nikon D300S, is featured in the current edition of The Nikonian eZine, available for free download (starts on page 25). Lens control has been optimised to reduce the frequency with which the “Initializing lens. Cannot focus.” message is displayed. An issue that, in some rare cases, prevented zoom operation has been resolved. An issue that caused the monitor display to exhibit a loss of detail in highlights (blown highlights) when the shutter-release button was pressed halfway with Active D-Lighting enabled has been resolved. You can give another Nikonian a membership as a gift. Make sure you know the members' username and then select "Give membership as a gift" in your user menu. You can select between a Silver, Gold or Platinum membership and the receiving Nikonian will directly be upgraded to the level you selected - or will have his/her membership extended if you selected the same level as the member already has. If you want to make the gift anonymously, you just go through the payment procedure without sending a message to the person afterwards. If you want to make sure the person knows who sent the gift, then you will have the chance to send a private message to the member after you paid. 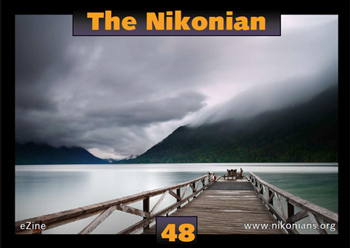 The newest edition of The Nikonian, our official nikonians.org magazine is available for free download featuring our 10th ANPAT Showcase and a hands-on comparison review of the Nikon D7000 and D300S. Our cover shot was taken by Gold member John Furlan (jlf), of California, USA. He calls it “Lake Crescent and Pier.” He used his Nikon D700 with PC-E NIKKOR 24mm f/3.5D ED lens at an f/9 aperture and 30 second shutter speed. The ISO was 200. A 3-stop hard graduated neutral density filter was placed along the lake’s edge with a 6-stop B+W ND filter to smooth the lake and clouds with the 30 second exposure time. Congratulations go to John, who also earned an Epson Stylus Photo R2880 Ink Jet Printer for making our cover. Download your free issue today! "The issue of visible hot pixels appearing in videos taken in low light with the D7000 was brought to our attention from a handful of our customers. Although this issue will not cause problems from a practical standpoint, in order to achieve a greater level of customer satisfaction, we have decided to offer a firmware update to reduce such occurrences. Details will be announced at a later date. For any enquiries, please contact the Nikon Customer Support Centre. onOne Software, makers of award-winning plug-ins for Adobe Photoshop, Adobe Lightroom & Apple Aperture have released Perfect Photo Suite 5.5. New in Perfect Photo Suite 5.5 is the next generation of Genuine Fractals now called Perfect Resize, with improved resizing controls and gallery wrap feature, new resizing algorithm, and more. Perfect Photo Suite 5.5 also features the all new Perfect Layers for adding a layered workflow for Lightroom and Aperture, and exciting new effects and frames in PhotoTools and PhotoFrame. All of the products in the Perfect Photo Suite 5.5 will work as plug-ins for Photoshop, Lightroom, and Aperture. But now, for the first time, five of the seven products in the Perfect Photo Suite will work as standalone applications, giving you the ultimate work-flow flexibility. Only PhotoTools and Mask Pro will require Photoshop. 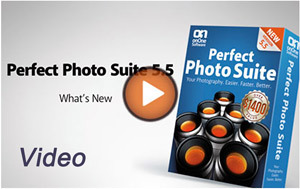 The new Perfect Photo Suite 5.5 is available immediately to owners of Plug-In Suite 5 as a free upgrade. New users may purchase Perfect Photo Suite 5.5 for $499.95 (USD). Purchased separately the products would normally cost $1,460. Existing owners of Plug-In Suite version 1, 2, 3 or 4 can upgrade to the Perfect Photo Suite 5.5 for $199.95. Customers who own one or more of the products in Perfect Photo Suite 5.5 can now upgrade as well by visiting https://www.ononesoftware.com/upgrade/. Congratulations to Nikonians Silver Member Pamela Stickney (jaw_fish) winner of a brand new Tamron SP70-300mm F4-5.6 Di VC USD (for Nikon) lens for submitting a comment to a review on this lens posted in our Resources section. Pamela, of Texas USA, commented on the review with a short note mentioning "Selecting the correct lens for a camera is getting harder and harder to accomplish for those of us who are not professionals." 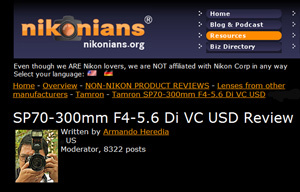 The review by Nikonians News Editor Armando Heredia (Covey22) drew over 100 comments and the Nikonians Editorial department randomly selected one of the submitting members to receive the lens absolutely free. This particular Lens Giveaway was sponsored by Tamron USA, and could only be offered to our USA members. For our many Nikonians members in Europe and other countries you are not forgotten or ignored. Your turn for a similar offer will be coming soon. Now an improved syntax to include images from the Nikonians galleries in any forum post is available. Just enter "[imglink:n]" while posting, where "n" is the ID of the image you want to include, e.g. [imglink:275173] to include the fancy group-shot of the ANPAT 10 group. The included images are clickable and shows the large-scale detail view of the image. If you are unsure about a certain image's ID, just open the image in the galleries so you see the detail view of it, e.g. for the "ANPAT 10 wild bunch" it would be this page. Below the image a new field "For forum post" is shown. Just copy & paste that info into your post and you're done. We will roll-out further forum enhancements in the coming weeks, among others an improved "editor" for posting and replying in the forums.